I will not abandon you, for I am glad to make you my own. because it has pleased Yahweh to make you a people to himself. Many people live with an abiding fear that they may be abandoned at any moment. Some of us feel like this because people have let us down in the past while others just don't live with a deep sense of belonging to anything or anyone. 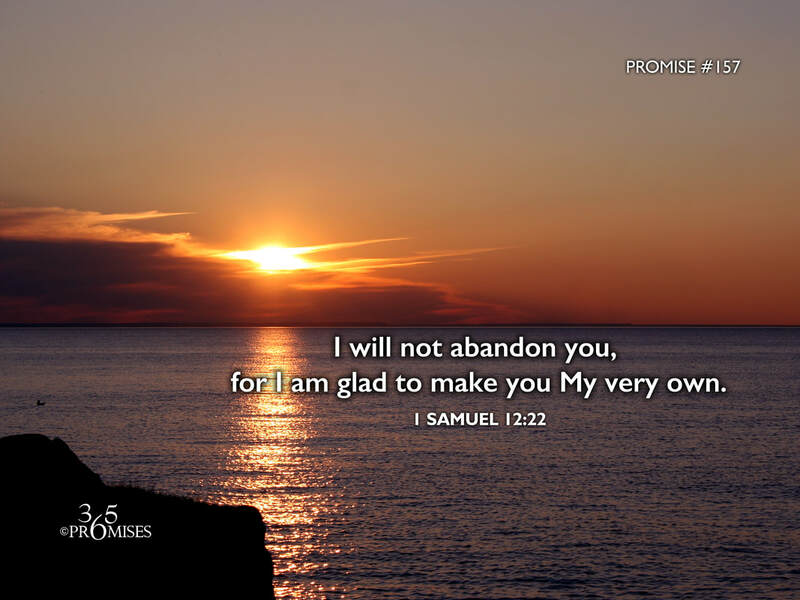 I love this promise because the LORD is settling the issue once and for all by declaring that He has purposed in His heart to not abandon us because of His own great name's sake. Isn't it good news to think that it doesn't depend on you and your good works... but on Him? This Bible verse says that God is actually very pleased to make you part of His family and for that reason, and that reason alone, He has promised to always stay close by. When I read this promise and think that I belong to God it blows my mind. Why does He want me? Why am I so valued to Him? The reality is that it is about His great heart for me and not my ability to earn or deserve His affection. The more that I can believe that it is about God's love for me and not my love for Him, the more that I will begin to walk in the tangible reality of living in His love every day of my life. I do not always live in the knowledge of His love for me because there is still a little orphan in my soul that sometimes strays away from the truth that I belong to God. Maybe you struggle with the same things. If so, my prayer for all of us is that we would know that our Heavenly Father was pleased to make us a part of His family...forever!